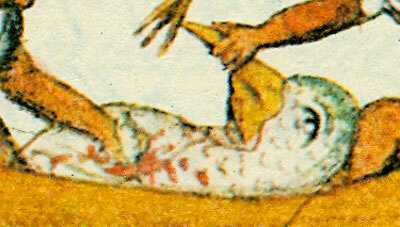 The picture comes from Book 11 of the Florentine Codex, titled ‘Earthly Things’. It describes the daily lives of, among others, the ‘water folk’ who made their living from catching fish, birds and other creatures of Lake Texcoco. In this example, local people speak of the dangers of hunting the ‘atotolin’ (literally ‘water-turkey’) or white American pelican. ’It is the ruler, the leader of all the birds... This pelican does not nest anywhere in the reeds; it always lives there in the middle of the water, and it is said that it is the heart of the lagoon because it lives in the middle. ’Also it sinks people. To sink them it only summons the wind; it sings, it cries out. It sinks them only when they try to catch it. To catch it they stalk it two, three or four days. But if they fail to catch it by the third day, on the fourth day the water folk prepare themselves and then assemble and steel themselves to go forth to die. For this is the custom of the water folk. ‘For this pelican, after four days, sits awaiting the water folk; it rests on the water’s surface; it sits looking at them. For if they fail to catch it in four days, by sunset, when the fifth sounds, the water folk thus know it is a sign that they will die; for they who have failed to catch it have been tried. ‘And when the pelican can be caught... they quickly, firmly grasp its bill; then they cast it into the boat. There they quickly disembowel it [while] it still lives. They disembowel it with a dart [with] three points at its head, called ‘minacachalli’.